You know those nail polishes that just speak to you the moment you see them? That beg for you to call them your own? 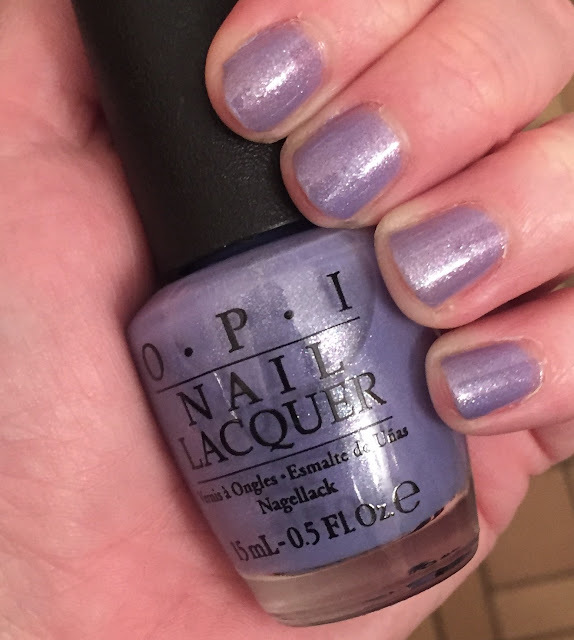 Well, that's how I felt about OPI Show Us Your Tips!, one of the colors from the new Spring 2016 New Orleans Collection. This is just one of those colors that I KNEW was going to be spectacular. All the swatches I saw made me want it more and more, until I just had to get it. And to say I'm not disappointed is a true understatement. This. Color. Is. EVERYTHING. It's a dusky bluish purple hybrid that's shot through with tons of multicolored shimmer. It's almost periwinkle, but on the darker end of the spectrum. The color glides on effortlessly and is extremely buildable -- I used two coats here and my nails are perfectly opaque, but I can see that a third coat would make them appear more blue instead of purple. I liked them more on the purple side, though, so I stopped at two. I also think this is one of those shades that would be equally perfect on tips and toes. In fact, I'm getting my first pedicure since the accident on Saturday (THANK THE LORD) and I may just have them paint my toes with this baby! I have to admit, I really don't love the name, especially with what it actually references about New Orleans. But I'm willing to overlook it because the color is just that stunningly gorgeous. It seems, though, that OPI would have been smart to name it after the blues, don't you think? In any case ... laissez les bon temps roulez! OPI Show Us Your Tips! retails for $10 at ulta.com. That is quite the pretty purple and looks great on you. Yeah for pedicures! This is not a me-shade but looks so pretty on you. I really need to get a pedi, too! This is just my kind of purple polish! G O R G E O U S!!!!!!!! This is one of my favorite OPI collections in a long time. I have on the Humidi-Tea collor right now. I might need to get this color next. Very pretty! I'd love to wear that color. It's so pretty and feminine. This is such a lovely purple shade. I think this is my favourite shade from the collection. It looks so great! The color is so pretty. I think I have something similar...I love purples of any shade. Periwinkle is my shade of choice for Spring. This one is just beautiful. I am dying to get my hands on this polish!! Love the shimmer in this polish! Definitely on of the standouts from this collection! that's such a pretty spring shade... I love me some purples and this one is really pretty.